A high-performance exhaust system helps your car perform correctly in more ways than you may realize, regardless of whether it has a stock or aftermarket exhaust system. Your car's performance exhaust system keeps the engine running correctly and toxic exhaust fumes from entering the interior. High-performance exhaust systems provide your vehicle with the best possible fuel efficiency while also reducing harmful exhaust emissions that pollute the air. Other functions of performance exhaust systems for cars include reducing the temperatures of the exhaust and muting engine noises. Make sure to stop by Meineke #2161 in Aberdeen, NJ, right away if you suspect your exhaust system has a problem. Exhaust systems experience a lot of wear and can develop leaks and cracks. Keeping track of the state of your muffler is important to your car's function and your safety. If you want your car to run smoothly and protect you from carbon monoxide poisoning, check on your car muffler. If your average miles per gallon are going down, the car is sounding louder, or a bad odor is coming from the car, you should stop by a muffler shop to get it repaired or have it replaced with a performance exhaust system. We'll perform all inspections, maintenance, and replacements needed at Meineke #2161 in Aberdeen, NJ. Performance exhaust system leaks can lead to far-reaching problems. You may think your car’s custom exhaust systems are designed just for muffling engine noise, but performance exhaust systems are also responsible for decreasing the amount of pollution that your car releases into the atmosphere. Properly functioning exhaust systems sound better and are safer for the environment. If your high-performance exhaust system fails, it can affect your fuel mileage as well as air quality. Aftermarket exhaust or stock exhaust systems are complex, but our emissions experts at Meineke #2161 in Aberdeen, NJ, can perform muffler repairs and get you driving safely again. Contact us today! A catalytic converter is a commonly overlooked item on a car. This component is located inside of the exhaust pipes. It reacts chemically with spent fuel vapors that pass through it and completely burns away pollutants before they reach the outside air. Manufacturers are required to warranty these components for only 80,000 miles. While necessary, catalytic converters also restrict the efficient flow of air through an engine, which can minimally reduce the power output. High performance exhaust systems overcome this limitation, and many aftermarket exhaust components enhance the original design. Replacing worn out catalytic converters and installing custom exhaust systems are complicated jobs. Contact our in Aberdeen, NJ, to see what we can do to improve or repair your vehicle. Once you learn that a new exhaust system is necessary to repair your vehicle, you may be wondering where to find the best muffler shop in Aberdeen, NJ. We have many locations available for you to choose from so you can get the performance exhaust system you need at a time and in a location that is easy and convenient for you. 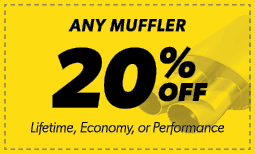 At Meineke #2161, we understand that muffler repair cost is one of the biggest concerns on your mind. Fortunately, our technicians are committed to giving you the best service possible to make your aftermarket exhaust repair experience a great one. Stop by today to learn how we can improve your ride’s performance with one of our affordable custom exhaust systems.